I really intended to keep my daughters 4th birthday low key this year. Just go to the park, play tag, eat pizza and cake with close family members and there you go. But then my soon to be four year old asked me ever so sweetly if she could wear her Beauty And The Beast princess dress her grandma got her early the summer before, and of course I had to say yes. Then my imagination and enthusiasm went a little crazy from there... like it always does at birthday party planning time. 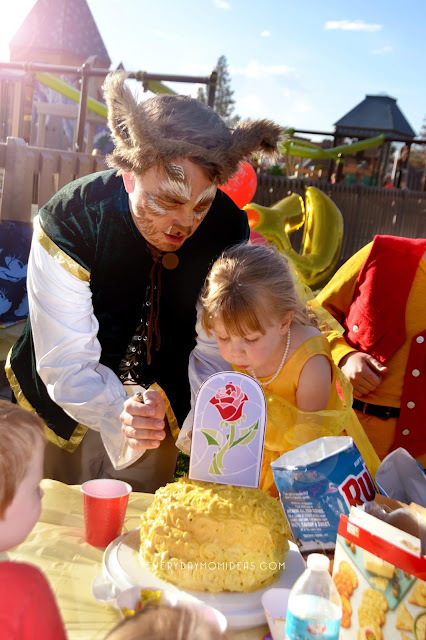 By the time her birthday rolled around the entire party turned into a magical adventure the whole family was in on. 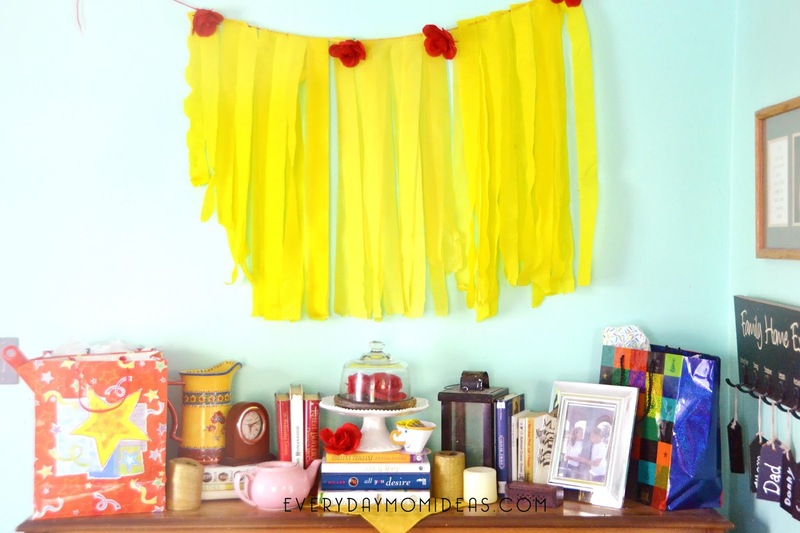 Even though the party was at the park later on her birthday I still decorated a small area in our home for a fun birthday breakfast surprise. Once we had breakfast it was off to the hair dressers for a new haircut and a Bell inspired updo. 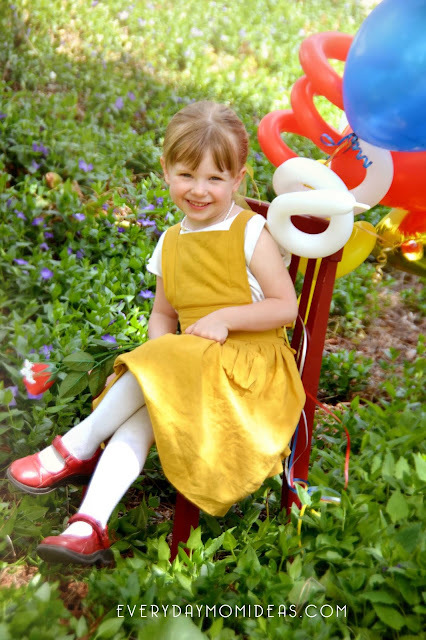 This cute little pinafore dress is one of my first sewing projects (with lots of help) and I had just finished it the night before her birthday. 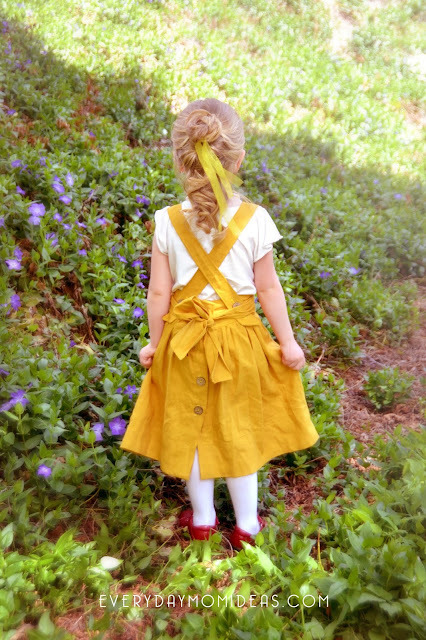 This yellow pinafore dress just happened to be the perfect color and vintage style for a Beauty And The Beast inspired photoshoot. She later changed into her fancy Belle ball gown for her birthday party at the park. 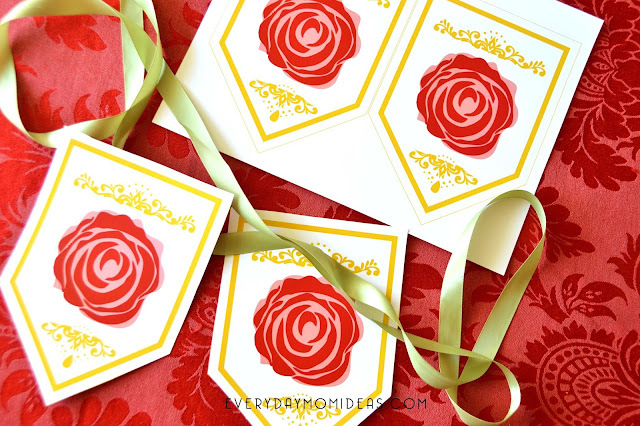 All my digital designs for this party started with this rose banner. I was just going to make the banner and thats it. But then I had to make a cake topper, and then I just had to have a Photo Booth and so on, and so on. It just kept growing. This amazing Photo Booth set is not my design ( I wish!) but you can get it at the POPOBELL Studio ETSY shop. 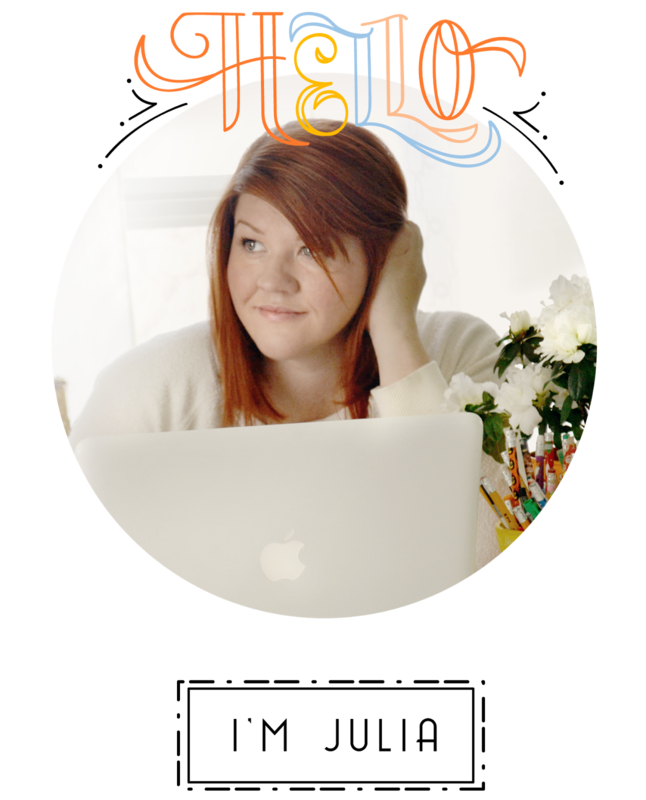 She make amazing printable party decor and you are going to want to check out her work. There really is no better photo booth props out there. 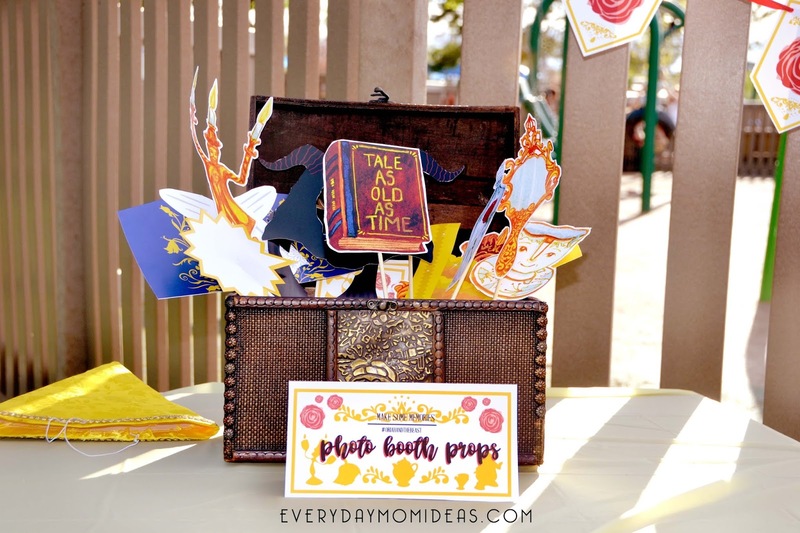 I did design the label for the photo booth props and my sons little chest proved to be the perfect container for the props. 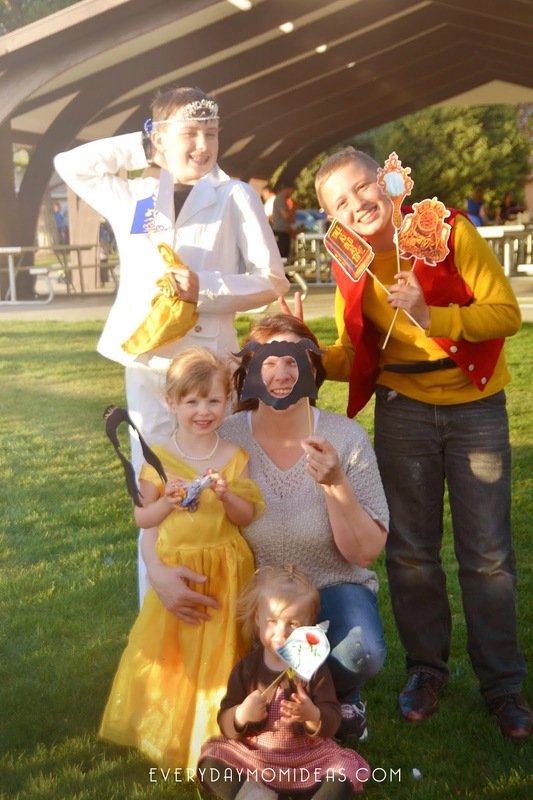 The props were a huge hit! The most popular activity was something everyone can have fun with no matter their age or ability. 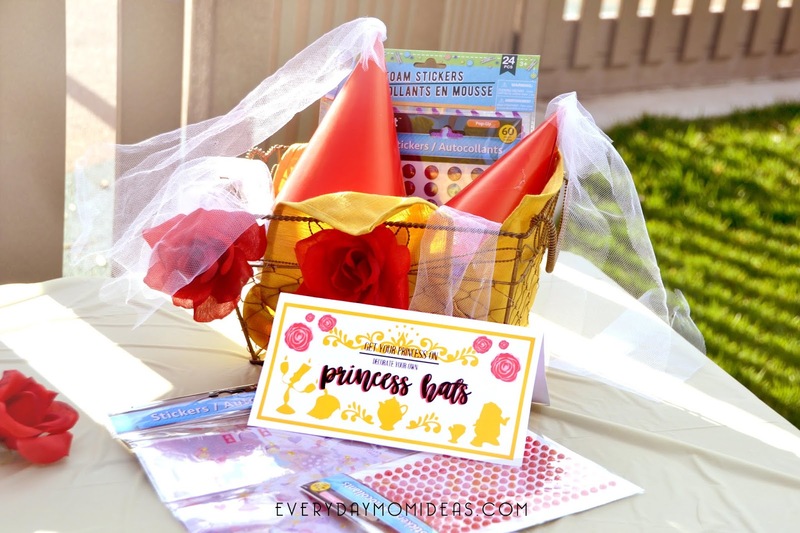 Here we have a little craft where your guest can design and decorate their own little princess hats. 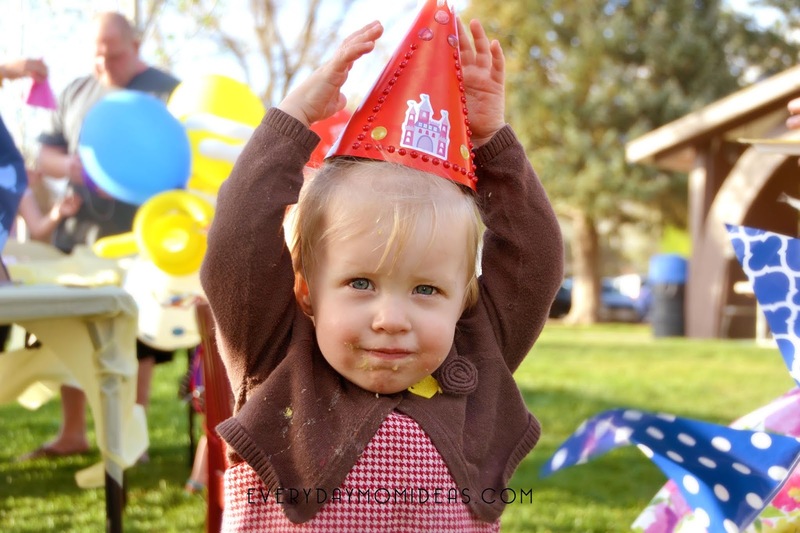 Just use cone shaped party hats and then hot glue some tulle on the end to create easy princess hats ahead of time. Then let your guest decorate the rest with stickers and glitter dots. TIP: Try to find things to decorate the hats with that have adhesive backs like stickers and glitter dots so you don't have to deal with the hassle and clean up of glue and scissors. This is another great design idea that I just adore. 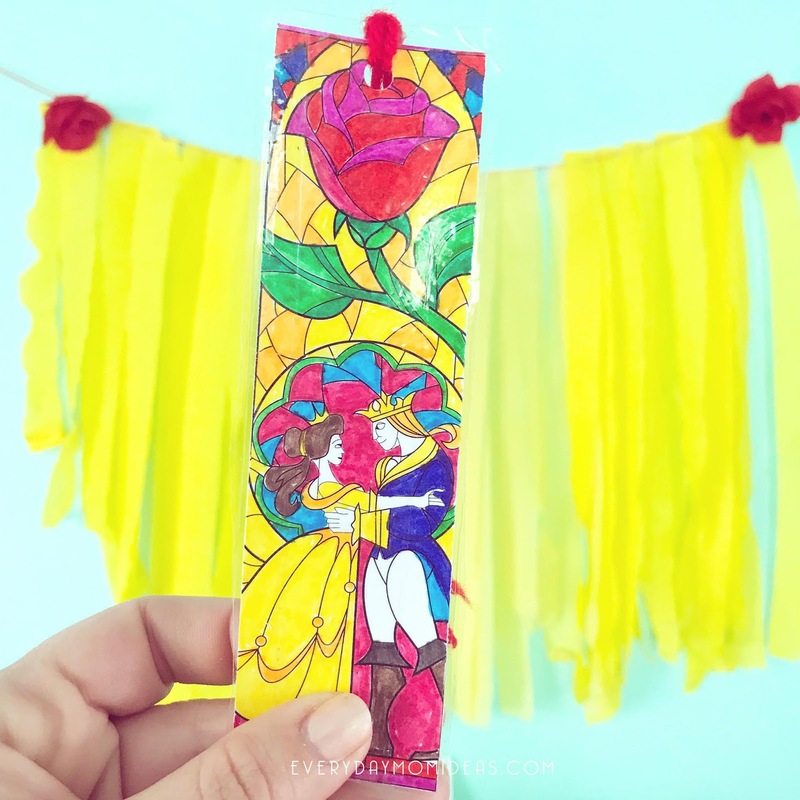 Jessica from Cutesy Crafts created these fantastic Beauty and the Beast bookmarks and they couldn't be more fitting for the party theme. Because of her deep love of reading I think Belle herself would approve of these adorable bookmarks that your guest can color. We colored our book marks with markers and added yarn tassels. TIP: Use clear packing tape to easily laminate the bookmarks so they will last longer. 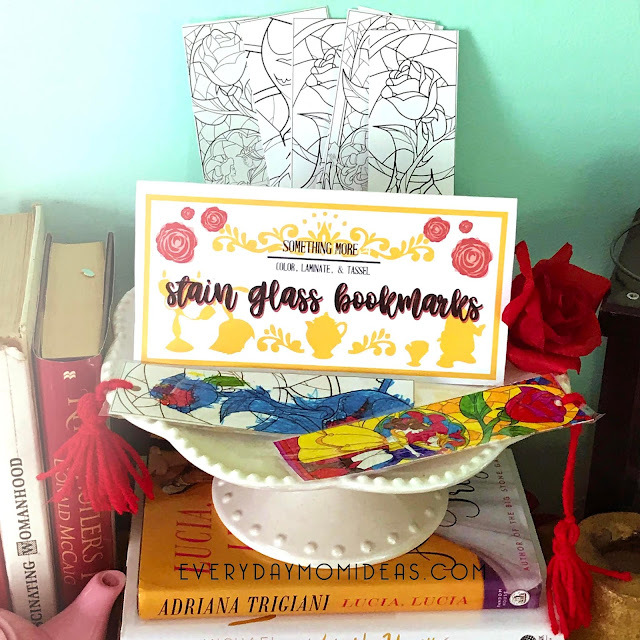 I designed the bookmark activity label that is also available via the Beauty and the Beast party printable pack at my ETSY shop. Playground obstacle course: This is a great game to get the kids active and burning off some of that sugar. You can keep this game simple and use a local play ground set as your obstacle course or set up something more elaborate in your own back yard. Use yellow streamers and wrap and/or tape the streamers along a playground set, to be used as a guide for your little guest to follow along while running through the obstacle course. You can place the Start label at the beginning and add the End to mark where the kids finish line will be. This is a timed game, you will need a timer. Each guest will run through the obstacle course at their ability as fast as they can. The person with the lowest amount of time through the obstacle course wins! Tip: Take this game to the next level with penalties for going off course or add multiple winners like, fastest time, most creative castle run, and doing the cause backwards. Obviously I am not a cake maker but Im not about to fork over a ton of money for a cake I can slightly pull off myself. LOL! This cake is super simple that a child could do. For real my kids helped me with most of it. I used three layers of chocolate round cakes and I just decorated it with simple spirals of yellow frosting to represent roses. I just used a sandwich bag with a small hole cut out of it as a cheap frosting pipe bag. The cake topper is a front and back printable of a stained glassed Rose In A Jar. To assemble the cake topper use two kabob stick and glue them in between the front and back cake topper papers. Make sure the sticks are not too close together but also not right at the edge of the paper either. 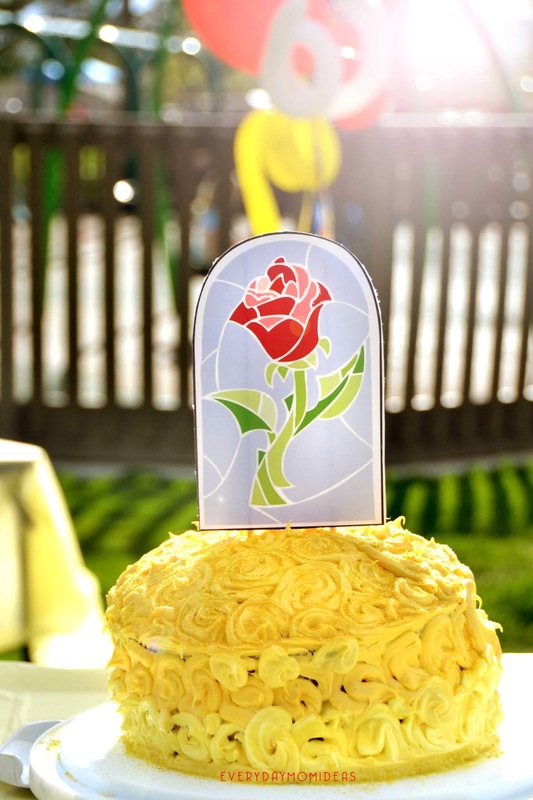 Then hot glue the edges of the paper together for a simple but fun Beauty And The Beast Cake. 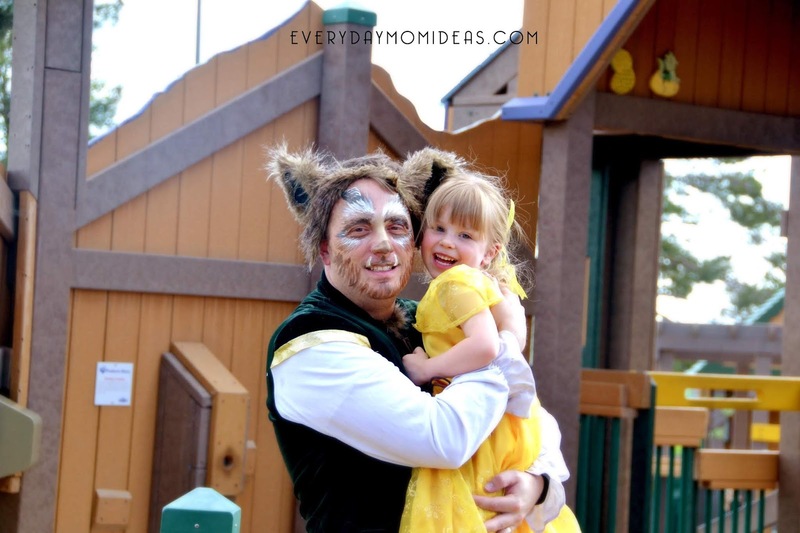 We were very fortunate to have an amazing park just 20 minutes from our home that has a Castle Theme to it perfect for what we were going for with this party! What is most amazing about this park is that its a ALL-Together Playground where kids with different disabilities can also play. They even have a wheel chair swing! So Amazing! Belle sure does love the Beast, even if he is grouchy sometimes and makes her eat her vegetables. We don't need a lot of money to celebrate big on birthdays we just need a little imagination and a whole lot of love. I think the highlight of the whole birthday was her dressing up with her dad. I still can't believe he let me do faceprinting on him! LOL! 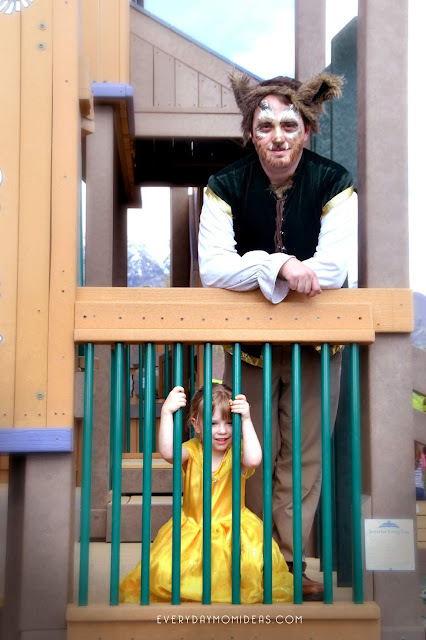 I loved watching the two of them enter the playground area and have kids staring and running up to them to stare some more or ask them funny questions. They even had a few kids who just shyly followed them around. 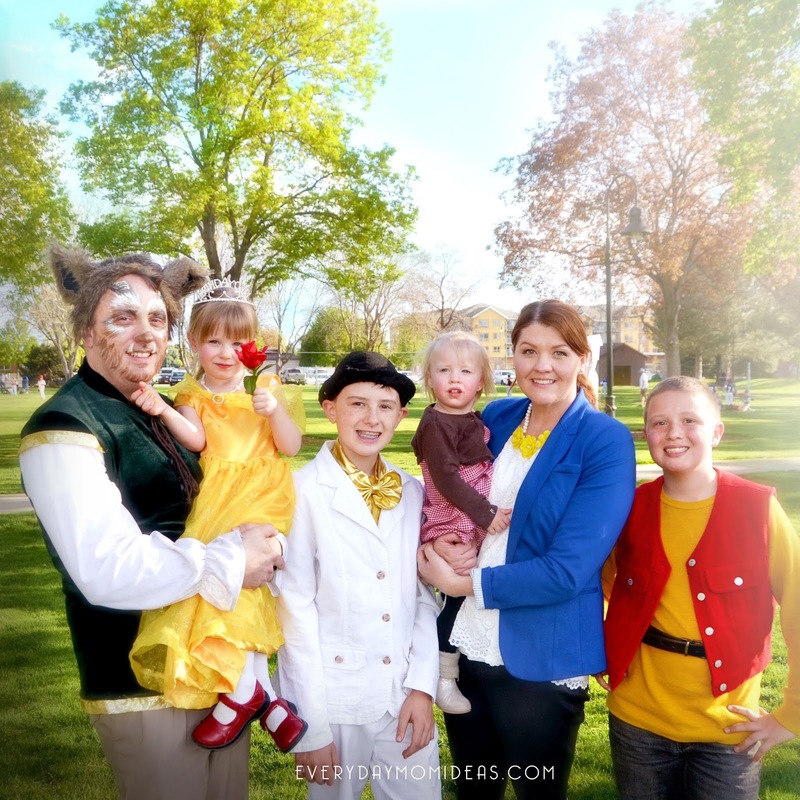 While my Husband and Birthday girl where the main stars of the show the rest of my kids and I created outfits inspired by different characters of Beauty And The Beast with clothes and things we already owned. We couldn't let them have all the dress up fun! 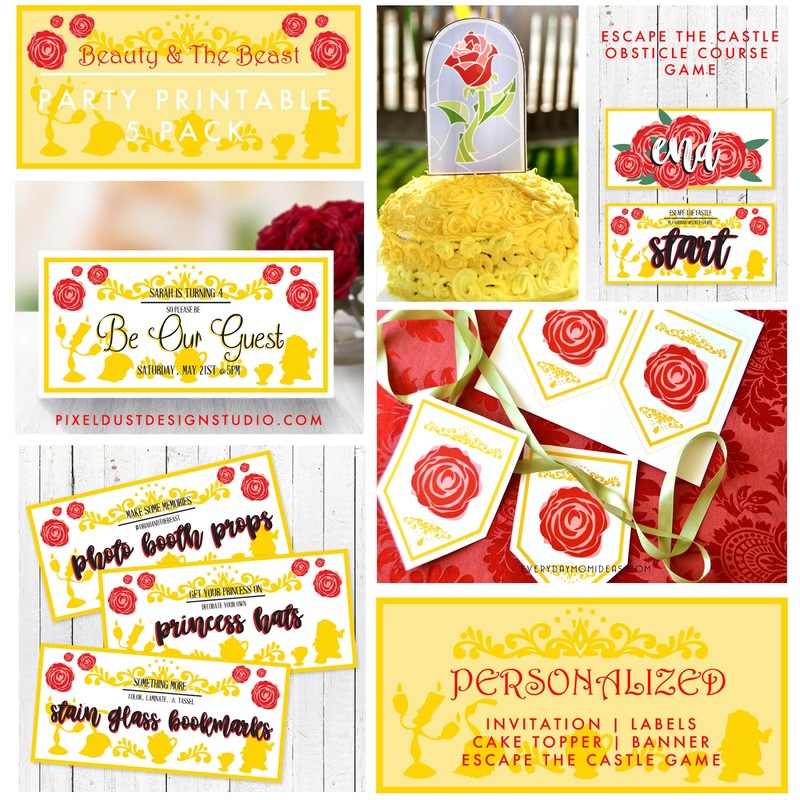 The Beauty and The Beast party printable pack is available on my ETSY Shop to order for your very own Event. You can request to personalize these for any event not just birthday parties. If you do not see something designed here I can always to a custom order as well. 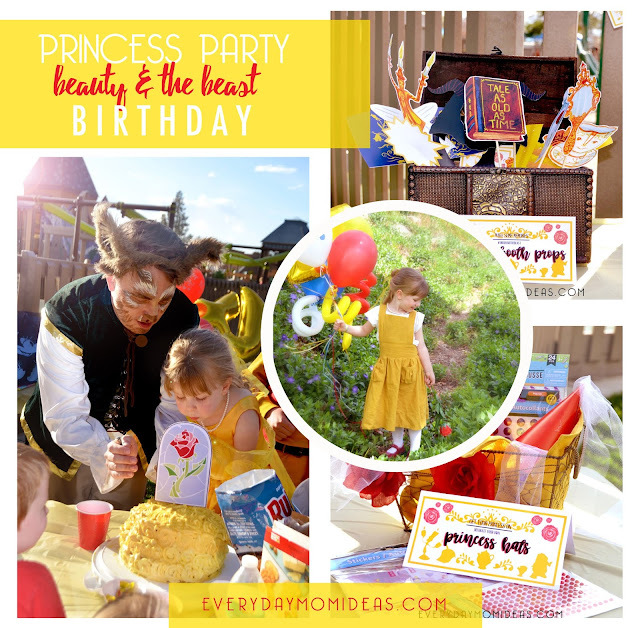 I hope you found some useful information here to create your own Beauty And The Beast Inspired party. We had so much fun putting it together in just two short days. 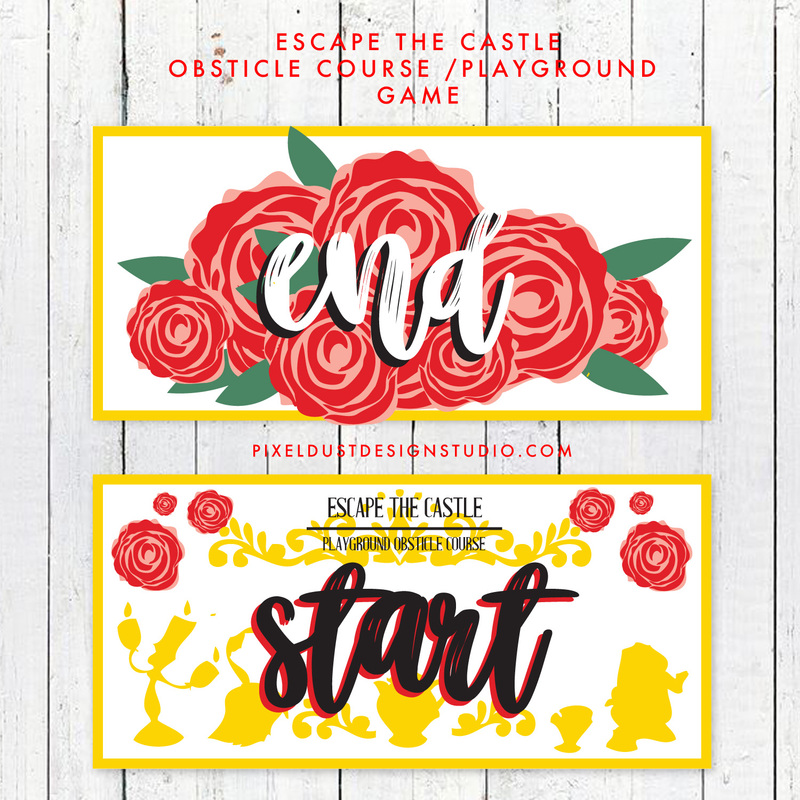 Now your party planning can go even faster with all these printable already designed for you to take some of the stress off. If you enjoyed this birthday blog post please share some love and share this Pinterest Friendly Image below with your friends and family or save it for later.